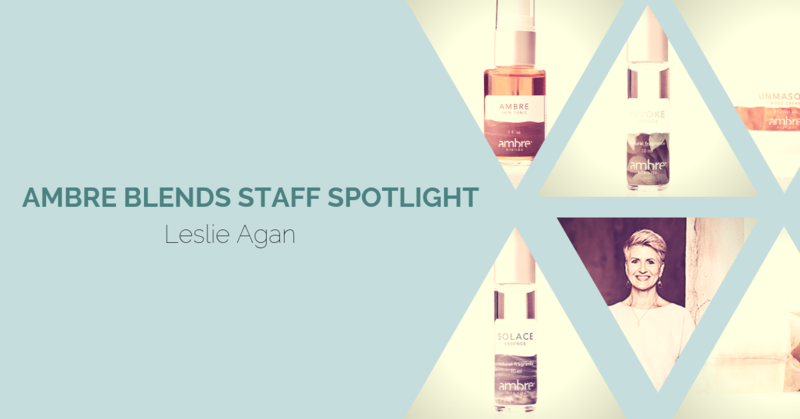 Meet the newest member of the Ambre Blends team, Leslie Agan! Leslie has taken the role of Production Manager for two months now, and you might be surprised to know that she is Ambre’s mom (along with being a mom to four others)! While we’re in the middle of expanding our building and gearing up to launch our fifth scent, Leslie is keeping the production team right on track. “The most important things to me in life are my relationship with Christ, my family (and six grandchildren), my love for what I do for a living and accomplishing goals I set for myself.” Find out more about Leslie in her Staff Spotlight! What is a day in the life of Leslie like? Blessed and busy! What is your favorite part about working for Ambre Blends? Creating all the different products and working with fun and wonderful people. What are some of your favorite organic products that you use? Ambre Blends, of course! My daughter has been waking me up to the world of natural products and organic foods over the years. Now I am paying attention and looking forward to exploring more as I now understand the importance of a healthy clean lifestyle. What is your favorite Ambre Blends product/essence? My go-to is Solace Essence. I wear the Oil Essence, Skin Tonic, Deodorant, Body Cream and I love burning the Soy Wax Candles. I mix Solace with all the other scents sometimes to change it up. So I guess you could say that I wear them all! I am very much looking forward to the new scent as I believe it will get people out of their comfort zone of just wearing Ambre Essence (original). We are actually making all the products now in the new scent to prepare for our launch in May. What is a fun fact about you that people don’t know? I enjoy horseback riding. What do you enjoy doing outside of work? Landscaping my yard. It’s mentally clearing and relieves the stress of my busy lifestyle. Why should people be using Ambre Blends? The love and passion that goes into the process. From the very beginning to fulfillment (shipping). Its a joyful process! What has been one of the most rewarding experiences about working at Ambre Blends? Working with my daughter. What was your first job? From 15 to 18 years of age, I worked at Laughners Cafeteria. To support my family which started at the ripe age of 21, I went into the dentistry field. Once my kids were in middle school, I started my own business sewing for designers in the greater Indianapolis area. I did that for 28 years and am now running the business while I can also step away and work with the growing company as Production Manager.